Shirley Chidsey was divorced from Donald Chidsey in the late 1930s. Shirley Chidsey lived in Tahiti for a time,typing and editing for the writing team, Nordhoff and Hall, who wrote BOUNTY trilogy. Their first novel, MUTINY ON THE BOUNTY,was the basis for the Clark Gable and Charles Laughton film released in 1935. 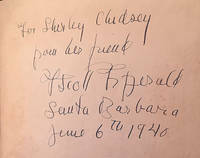 Returning from Tahiti in 1940, Shirley Chidsey traveled to Santa Barbara, California in June to visit with F. Scott Fitzgerald; and here is where Fitzgerald inscribed this book to her. This book was purchased from the estate of Margaret "Peg" Armitage Elliot, sister of Shirley Armitage Chidsey Bridgewater. Okay, here goes: the book's condition. Inscription clear and concise on front endpaper, cloth faded, showing moisture spots; gold printon spine very faded lower right-hand corner of front cover chipped with a noticeable bit of corner missingBook pages lightly tonedIndentation and/or chewing of inner lower left-hand inside gutter area of first five or six pages.Spine slip-cocked. Dust jacket tattered; old tape removed; and, somewhere along the years, acid-free,neutral pH conservation work performed on back, resulting in a reasonably appearing example ofthe second printing dust jacket. Otherwise, a charming example. The third printing of this book is evident on Page 320,Line 17, wherein, "Charles Warren," becomes "Devereux Warren"
Shirley Chidsey married William Bridgewater after World War II. Bridgewater was the editor of the Columbia Encyclopedia. Shirley thenworked for Mrs. Alfred Knopf, and in this position met such authors as Norman Mailer. Keywords: F. Scott Fitzgerald inscribed first edition in original dust jacket.